I warn the reader that this post will contain random ramblings and at some certain point may not even make much sense. There are just things that I have to lay out and get rid of it so I can go on to write the stuff that I need to for money ;). YUCK! 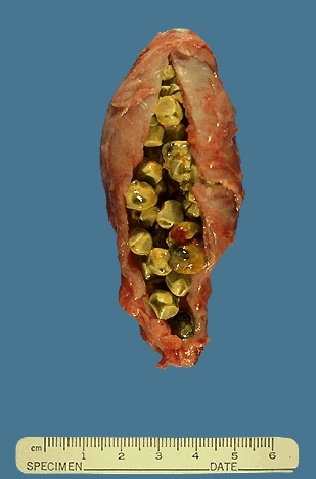 Those are gallstones stuck in a gallbladder. I am one of the 16-22 million people in the world plagued with symptomatic gallstones. The space between my attacks has been getting narrower and narrower recently therefore preventing me to live and exist as a normal human being. I did my first bout of cleansing a week ago, the first few days were fine but the last 2 days were short something short of hellish. I have missed many parties, trips and deadlines due to these pesky little (sometimes big) balls of hardened green mush stuck in my gallbladder. I have a 3 year old daughter that I adore even if her feet often find my left side in the middle of the night with a "dead-weight kick". I have 3 articles I need to write on 3 different topics not relating to each other which I haven't even gotten started on eventhough it was assigned to me last week. Gallstones have made me feel "average", which totally depresses me because up until a few months ago, I used to see myself as an invincible goddess/ruler of the night and pacific regions. All I really want to do is get my life back into what it used to be. I feel uninspired, defeated and helpless. The only thing on my mind most of the time is when will I be rid of the pesky "vermins"!